After you created a hedge rule you can activate or deactivate them for your spreads. This can be done from the Hedge Manager window or Autospreader Configuration window. Open the Hedge Manager window. In the Rules section of the window, locate the desired spread and click to enable (or disable) the Active check box. Open the Autospreader Configuration window. 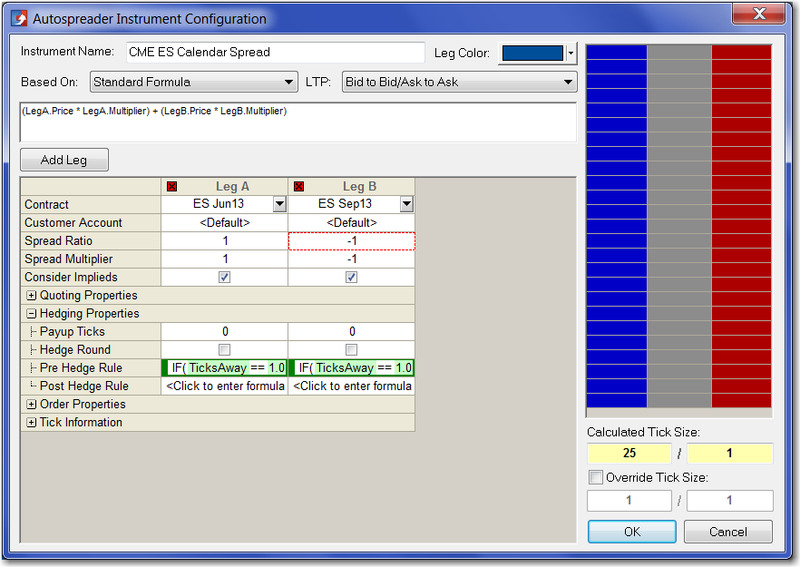 For the desired spread leg, click the Pre Hedge Rule or Post Hedge Rule field. The Hedge Rule Builder window appears. In the Hedge Rule Builder window, define or load a valid formula. Click OK. The rule appears in the field and is automatically activated. Repeat the process for each spread leg rule you want to activate. When finished, click OK to close the window and apply the rules to the spread.